Yet another WCF film not being released by MoC. I wonder if it will come out on Blu-ray. Excellent news! Was hoping this would be from MoC - much like Black Girl/Borom Sarret which was released by the BFI for some reason. Are Eureka no longer 'official UK partners' of WCP/The Film Foundation? Also fingers crossed for Blu-ray. I'm assuming it's HD-ready if it has been restored by WCP? It'd be weird if this film weren't on Blu-ray, and the same goes for The Shop on High Street. swo17 wrote: Yet another WCF film not being released by MoC. I wonder if it will come out on Blu-ray. According to the Coming Soon info on Second Run's website, it will! The extraordinary films of Thai filmmaker and artist Apichatpong Weerasethakul (BLISSFULLY YOURS, TROPICAL MALADY, SYNDROMES AND A CENTURY, Cannes Palme d Or-winner UNCLE BOONMEE WHO CAN RECALL HIS PAST LIVES, CEMETERY OF SPLENDOUR) have defined him as one of contemporary cinema s most unique voices. 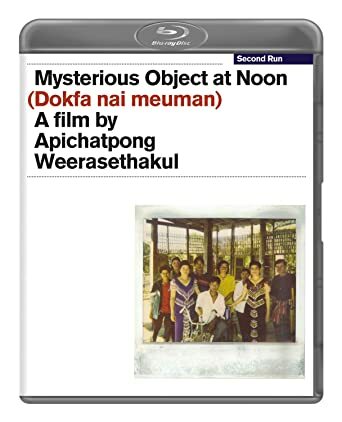 Apichatpong's hallucinatory debut feature MYSTERIOUS OBJECT AT NOON is an experimental documentary mix that wends its way through the landscapes and mindscapes of rural Thailand. A film crew travels from the Thai countryside to Bangkok, asking the people they encounter along the way to expand upon a story involving a wheelchair-bound young boy and his teacher. The resulting stories are later re-enacted by non-professional actors in dramatic re-creations of the freely associated narrative strokes supplied. The daisy-chain structure of interlocking vignettes is inspired by the surrealist game Exquisite Corpses, and its formal strategies are aligned with both documentary realism and the avant-garde, but this boldly original debut looks and feels like nothing else. Second Run present the film from a new 3K restoration by the Austrian Film Museum and Martin Scorsese's World Cinema Foundation - and includes exclusive extra features. Presented from a new 3K restoration by the Austrian Film Museum and Martin Scorsese's World Cinema Foundation. New and exclusive filmed interview with director Apichatpong Weerasethakul. Booklet featuring a new essay on the film by film historian and author Tony Rayns. 3K scans are more common than you'd think. Arrow routinely scans at 3K to allow leeway for stabilising shots during the subsequent 2K restoration. I didn't question the existence of 3K scans, but it's the first time I have heard of a 3K restoration. Thanks for the heads up! Arrow reward points brought the already nice sales price down a bit more. Horse Money is also at a good price there. Now the amazon description has changed to 2K restoration. The Film Foundation's website says 3K, so now I'm wondering if someone at Amazon thought "3K?" and "corrected" it to 2K. It may well be a 3K scan and a 2K restoration, which is absolutely standard practice - the reason for the higher-resolution scan being to allow leeway for reframing and stabilisation. I don't want to draw any purchases away from Second Run's BluRay (which I've already ordered), but fans of the film and Weerasethakul might want to know that Edition Filmmuseum's forthcoming DVD of this film (from the same restoration but not in HD, obviously) has complementary extras in the form of three different shorts: thirdworld (already released by Second Run on their Tropical Malady DVD), Worldly Desire (available on BFI's Syndromes and a Century) and Monsoon (not available on DVD?). I imagine it'd be a pain to pull off logistically, but a collection of Weerasethakul's shorts would be an instant buy (even a disc that only had Mobile Men on it). AlexHansen wrote: I imagine it'd be a pain to pull off logistically, but a collection of Weerasethakul's shorts would be an instant buy (even a disc that only had Mobile Men on it). I find them rather hit and miss, but there are some fine ones amongst them. You should probably include his "not quite features" like Mekong Hotel as well. I saw a DCP of the restoration last night. As noted on the Film Foundation's website, the original camera reversal element is lost and the best available source was the negative made from it; not noted on the Film Foundation's website is that this negative has ingrained English subtitles, which meant the entire presentation was half-letterboxed (black bar on the bottom) to accommodate the subs—two-line subs have the top line superimposed over the image itself, as seen on the old DVDs, so there was no way to get a "clean" picture sans subtitles. I can only assume that DVDs and BDs of the restored version will be the same in this respect. The upshot is that it looked far better than the existing video editions, with the heavy grain that dissolved into a mush of video noise on the old DVDs now looking at least something like grain. There is, however, one brief section about 15-20 minutes in where it drops to SD quality; perhaps this part always looked worse, but my guess is that they didn't have a usable film element for these shots and fell back on an existing video master. I'm sure it still looks better than the screenings of Blissfully Yours that are being done as part of the same touring Apichatpong retrospective, which are using the retail DVD because there's no DCP and Strand no longer has a print. Last edited by The Fanciful Norwegian on Tue Mar 29, 2016 4:15 am, edited 1 time in total. Good grief. It's sad to hear the films are still in such relatively rough shape. I understand well enough about Mysterious being the best they could do but that is just nuts they're touring a retro with Blissfully Yours as a DVD. What a bummer. Second Run was going to go public on this very soon, but since you've started the ball rolling it might as well be today. Yes, as you've correctly surmised, the best surviving source for Mysterious Object at Noon unavoidably has burned-in English subtitles. Obviously, this is far from an ideal situation, but there's nothing that can realistically be done about it short of finding the missing camera negative. Mysterious Object at Noon was shot on 16mm black and white reversal film stock and subsequently blown-up to 35mm for theatrical release. The 16mm original camera reversal print no longer exists. The restoration therefore drew on the best surviving element – the 35mm blow-up inter-negative. Apichatpong Weerasethakul had deposited this negative with the Austrian Film Museum in 2007. In 2015, it was repatriated and is now held at the Thai Film Archive in Bangkok. The Austrian Film Museum scanned the negative at 3K resolution (3072 x 2160 pixels) and a bit depth of 10-bit (logarithmic scale) on its own ARRISCAN ideally suited to archival film elements. The aim of the ensuing digital image restoration was to remove, as best as possible, the ravages of time upon the negative without correcting any inherent defects stemming from the films’ original production circumstances. Its characteristic “grainy” look was therefore retained, while printing errors such as repeated frames or jump cuts went deliberately untouched. Another attribute of the source material that was not corrected were the English subtitles that were ingrained on the negative at the time of its creation. Rather than attempt to remove the subtitles digitally, which ran the risk of introducing unwanted visual ‘artifacts’, it was decided to retain them as a permanent reminder of the film’s suboptimal survival status. At the request of director Apichatpong Weerasethakul, the subtitles were corrected and enhanced where necessary. Digital colour grading was carried out at the Listo Videofilm laboratory in Vienna under the personal supervision of Apichatpong Weerasethakul. As with the digital image restoration, no attempt was made to rectify the ‘overexposed’ look of the original film. Listo also handled the printing and processing of the new analog preservation and access elements. As the original DAT master tapes could not be located, the 35mm optical soundtrack negative served as the source for the sound restoration. The soundtrack negatives were digitised at 24-bit/48kHz at the specialised film restoration laboratory L’Immagine Ritrovata in Bologna on a Sondor OMA E fitted with COSP-Xi 2K ™. Sound restoration was carried out at Technicolor Thailand, Ltd., during which the original Dolby Stereo track was remixed into a more contemporary 5.1 surround sound configuration. Once all restoration had been completed, new 35mm image and soundtrack negatives were created for optimal long term preservation. From these negatives, new 35mm prints were struck to facilitate continued access to the film in its original presentation format. At the same time, 2K and 4K Digital Cinema Packages were produced for modern digital theatrical presentation. On this disc, Mysterious Object at Noon is presented in its original 1.78:1 aspect ratio. To accommodate the English subtitles which were partly printed outside the image borders, the picture has been window-boxed slightly on the bottom, left and right sides. I haven't seen the end result myself, but from the above it certainly sounds as though they did the most thorough and conscientious job with it that they could have done. Put it like this: if I'd been overseeing this project I can't think of anything I'd have done differently given what they had to work with.